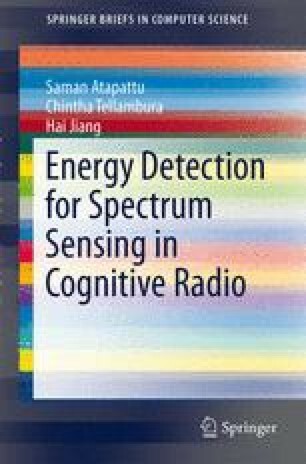 As mentioned before, the energy detector senses spectrum holes by determining whether the primary signal is absent or present in a given frequency slot. The energy detector typically operates without prior knowledge of the primary signal parameters. Its key parameters, including detection threshold, number of samples, and estimated noise power, determine the detection performance. ECMA-International (2012) MAC and PHY for operation in TV white space. http://www.ecma-international.org/publications/files/ECMA-ST/ECMA-392.pdf.